Press is very welcome at the camp - openess towards the public was and is one of our core values at the CCC. However, we ask you to care about some rules to protect the privacy of our guests. 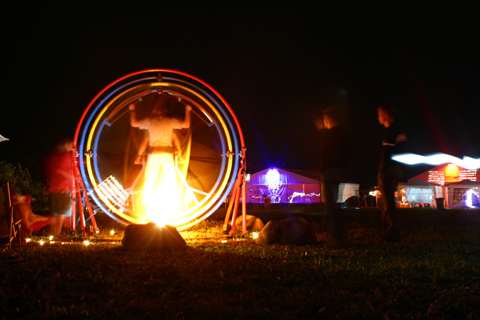 The Chaos Communication Camp is a holiday event for hackers, nerds and other beeings with a creative and critical view of live. The participants expect the press people to show a certain degree of non-intrusive behavior, especially regarding the right not to be filmed or photographed. Some participants neither want to be filmed, photographed or interviewed. Journalists are kindly asked to respect the spirit of event and the requirements of the participants. The north-eastern part of the camp site is our "no camera zone". Taking pictures or movies there is strictly prohibited. This zone will be clearly marked in the camp plan and by signs at the camp site. Please respect the privacy of our participants. The participants of the Chaos Communication Camp insist on their right to their own image. Therefore even when events are recorded no pictures of participants may be taken unless explicit permission is granted. Please register at camp-press@cccv.de before August, 1st to get free entry. Registrations on or after August 1st are not possible, you will have to pay for a usual day pass. Please add to your mail the media you are working for and the day you wish to come. Every member of the press is obliged to carry a card with the word "PRESS" on it, clearly visible. The IDs will be given out at the entrance. Participants decide by themselves if they want to speak to journalists or nor and if they want to be photographed or filmed in any way. Please respect this right all the times. With the exception of the no-camera zone, cameras are allowed at the Camp. If you use your photography equipment within the no-camera zone you will be banned from the Camp area. As curious hackers, we are more than happy if you are able to send us an exemplar of your article about the camp. Please mail them to CCCV, Postfach 640236, 10048 Berlin, Germany. Thank you very much in advance!